The Snow Joe Sun Joe SPX3000 electric pressure washer delivers a powerful performance of 2030 PSI pressure and 1.76 GPM water flow with a 14.5-Amp motor. It can tackle a variety of cleaning tasks: homes, buildings, RV’s, cars, trucks, boats, decks, driveways, patios, lawn equipment and more. This machine can remove tar and grease from concrete, heavy mildew stains, oil stains, rust from steel, caked mud on equipment, and other stubborn gunk and grime. Equipped with a dual detergent tank system, the Pressure Joe SPX3000 carries and stores two different types of detergent simultaneously in its two 0.9 L onboard, removable detergent tanks. Its 34-inch extension spray wand and rear wheels provide easy maneuverability and access to hard-to-reach areas. This pressure washer comes with five quick connect spray nozzles (0º, 15º, 25º, 40º and soap). Other features on the SPX3000 include a 20-foot high pressure hose, 35-foot power cord, garden hose adaptor and a TSS (Total Stop System) trigger that automatically shuts off the pump when the trigger is not engaged. Its 34-inch extension spray wand and rear wheels provide easy maneuverability and access to hard-to-reach areas. This pressure washer comes with five quick connect spray nozzles (0º, 15º, 25º, 40º and soap). Other features on the SPX3000 include a 20-foot high pressure hose, 35-foot power cord, garden hose adaptor and a TSS (Total Stop System) trigger that automatically shuts off the pump when the trigger is not engaged. Users find this machine easy to assemble and operate. It is very easy to move around too. However, many user reviews complain about the leakage from this unit. Users report that included hose connector is of cheap quality and may leak. Overall, the Snow Joe Sun Joe SPX3000 2030 PSI 1.76 GPM Electric Pressure Washer is liked and highly recommended by users for its performance, versatility and power. The Campbell Hausfeld PW1350 Electric Pressure Washer is perfect for everyday small duty jobs in or around he house. This compact and versatile power washer can be started and stopped instantly and it becomes operational only after the trigger is pulled. This instant stop/start feature prolongs and protects the motor's life. This lightweight electric pressure washer offers easy mobility and is convenient for cleaning patio furniture, cars, spraying off fences, and various other small household tasks. It includes an adjustable fan lance and offers fitting on-board storage for both the lance and spray gun. The swivel adapter enables attaching it to a garden hose. The Campbell Hausfeld PW1350 Electric Pressure Washer is perfect for everyday small duty jobs in or around he house. This compact and versatile power washer can be started and stopped instantly and it becomes operational only after the trigger is pulled. This instant stop/start feature prolongs and protects the motor's life. This lightweight electric pressure washer offers easy mobility and is convenient for cleaning patio furniture, cars, spraying off fences, and various other small household tasks. It includes an adjustable fan lance and offers fitting on-board storage for both the lance and spray gun. The swivel adapter enables attaching it to a garden hose. Its 20 ft. high pressure hose and 35 ft long power cord enables you to reach even far away objects easily. This pressure washer has plenty of power but not enough power for cleaning 2 story house or other hard jobs like stripping off paint. Overall, the Campbell Hausfeld PW1350 Pressure Washer is highly rated and highly recommended by users for its compact design and enough power for everyday clearing jobs. This unit is perfect for small to medium sized jobs and has been one of the best performing lightweight washers on the market. The Ryobi RY80940 is a 3100-PSI pressure washer with 2.5-GPM of water flow to handle toughest cleaning jobs. Featuring a powerful 187 cc Honda gasoline engine, this pressure washer delivers plenty of power and force for quick cleaning of driveways, decks, siding, windows and more. The engine is equipped with Idle Down technology for increased fuel efficiency and increased runtime. This Pressure Washer also features many accessory including a 5-in-1 nozzle for easy spray pattern adjustments, and a 25 ft. PowerFlex high-pressure hose for easy hose management. Users are very happy with the easy start of this machine. It starts on the first or second pull consistently. Users are very happy with the easy start of this machine. It starts on the first or second pull consistently. 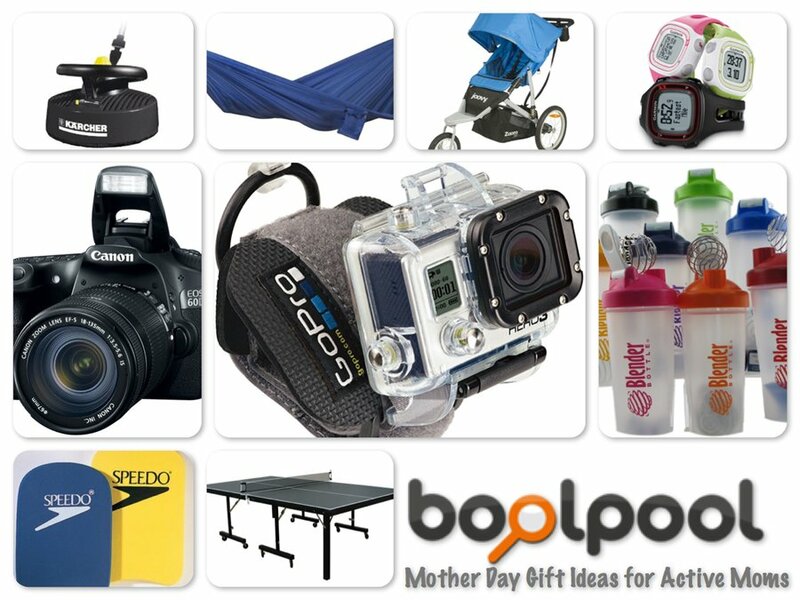 Users also like the on-board detergent tank and storage for accessories. The machine is easy to assemble right out of the box. 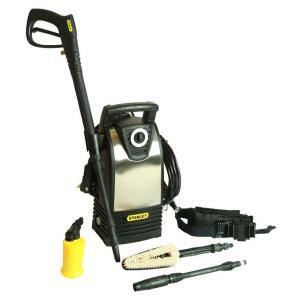 This Ryobi pressure washer also features a maintenance free aluminum pump. All this is backed by Ryobi's outstanding 3 year warranty. However, some user reviews mention that the hose should have been longer. The 25 feet length is short for few users. Also some users complain that hose can be hard to roll up. In a few cases, the pressure washer broke down after using few days. Overall, the Ryobi 3100-PSI 2.5-GPM Honda Engine Gas Pressure Washer with Idle Down (Model: RY80940) is well liked and recommended by users. It is a powerful and easy to use pressure washer. The Powerworks 51102, 1700PSI. 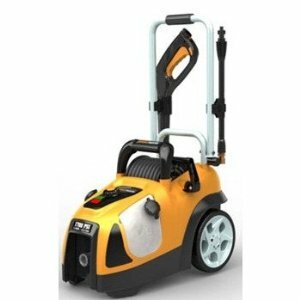 1.4GPM quite induction motor electric pressure washer is a well designed machine with enough power for washing decks, patios, driveways, cars, fences etc, at home. 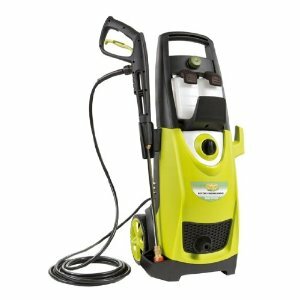 This compact pressure washer includes 35-foot power cord with GFCI and a 25-foot high pressure PVC/plastic hose (1/4 inch diameter) and hose reel, along with 2 built in soap tanks. The fold up handle and rear wheels make this unit easy to move around, use and store. The induction motor is surprisingly quiet and the low center of gravity prevents tipping over of the machine when in use. This Powerworks 51102 power washer also features leak-free Brass fitting for hose connection, different spray nozzles and plastic spray gun with quick connect wand. However, some user reviews mention that the pressure hose is proprietary in this machine and it does not work with generic hoses. A few users complain about recessed water hose connection. 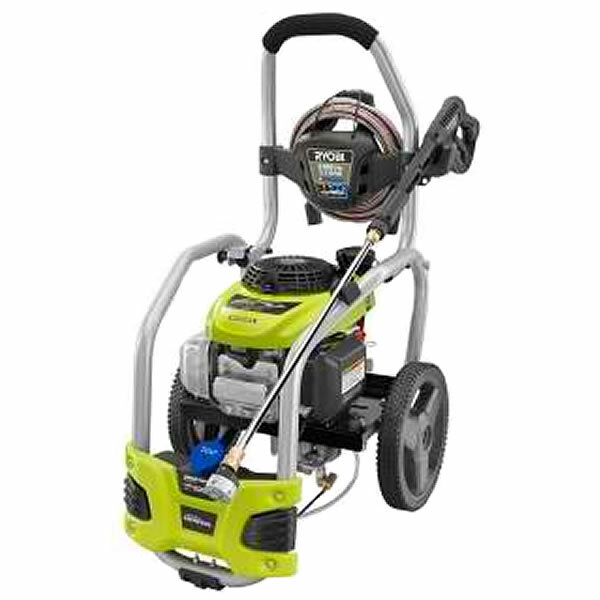 Overall, the Powerworks 51102 1700 PSI Electric Pressure Washer 1.4GPM with Quiet Induction Motor is a highly rated and well recommended pressure washer for home use. 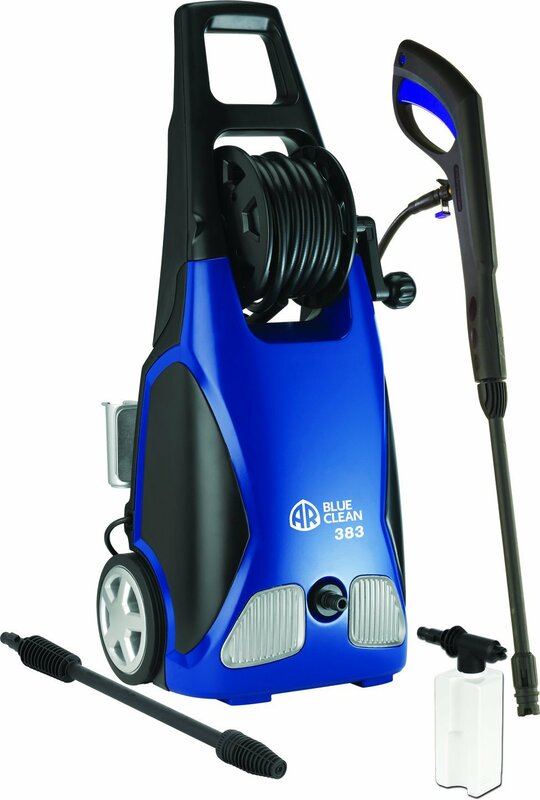 The AR Blue Clean AR383 is a cold water pressure washer which gives 1,900 PSI of water pressure and 1.5 GPM of water flow for most residential cleaning applications. This 14 Amp electric pressure washer has a Triplex Plunger pump with axial wobble plate and a Total Stop System for automatic start/stop by use of trigger. 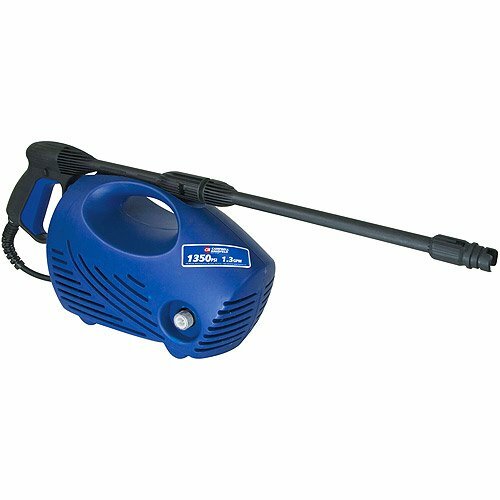 This unit is extremely powerful for a residential electric power washer and works well for cleaning deck, siding, brick patio, cars and patio furniture etc. A trolley with wheels, compact design and light weight makes this unit easy to move around and use. 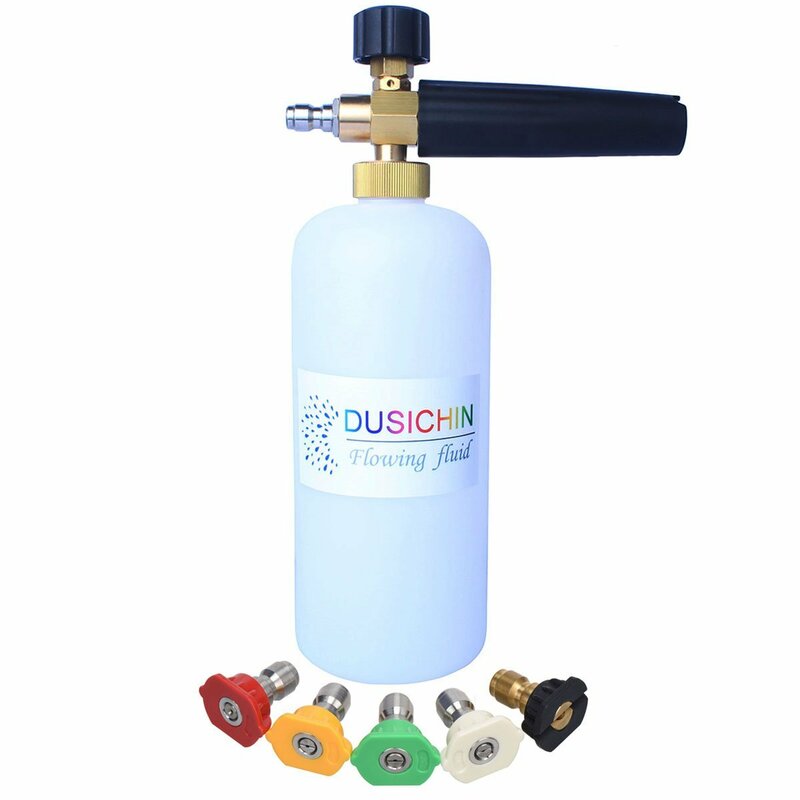 It comes with a quick connect garden hose adapter, adjustable spray head with special fan jet settings and a foam soap dispenser. This pressure washer is easy to assemble and has a quiet motor. A 30 ft. long power cord and 20 ft. long high pressure hose makes this unit easy to use. However, many user reviews complain that the plastic parts are bit light duty and may leak. Many users replaced the plastic parts with brass quick connects. This machine does not have enough power to strip paint off deck. Also, in some cases, unit broke down after some usage. Overall, the AR Blue Clean AR383 1,900 PSI 1.5 GPM 14 Amp Electric Pressure Washer is highly rated and recommended by user for its power, performance and ease of use for cleaning projects in and around the house. 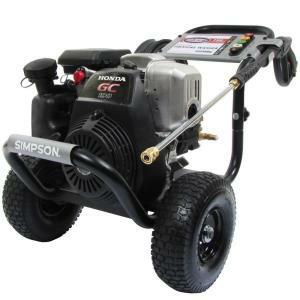 The Simpson Honda GC190 MegaShot 3100-PSI 2.5-GPM Gas Pressure Washer (Model: MSH3125-S) is specially designed for the home and shop as it gives maximum performance with minimal investment. This pressure washer is easy to start and simple to use for cleaning decks, patios, house siding, outdoor furniture, and prepping home exteriors for painting. 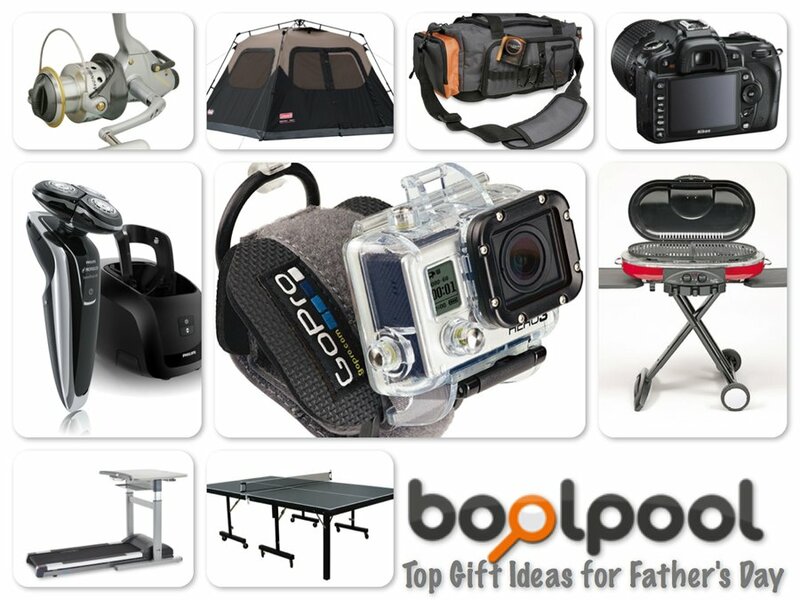 Its compact design is lightweight and small enough to be easily transported by one person. The Simpson MegaShot is equipped with premium Honda OHC Engine that are built with high-quality components, designed for optimum performance in the harshest environments, and renowned for being easy to start, consistently. An exceptionally strong welded steel frame body and big pneumatic wheels provide great mobility across most any surface. Pro-style quick connect spray wands and nozzles with ergonomic spray gun allows users to operate with ease. It also includes MorFlex high pressure hose that provides high flexibility, is non-marring, kink and abrasion resistant, and equipped with easy twist-on connectors. The ergonomic spray gun is designed to be comfortable and easy to operate with a safety lock-out to prevent gun from being accidentally activated. However, some user reviews complain that nozzles vibrate out of the rubber holder which is meant for storage. Also some users would like to see a longer hose with this pressure washer. Overall, the Simpson Honda GC190 MegaShot 3100-PSI 2.5-GPM Gas Pressure Washer (Model: MSH3125-S) is a highly rated and well liked by users. It comes with limited warranty for consumer use for 2 Years on Honda GC engine, 1 Year on frame and pump components, 90 Days on spray accessory items. 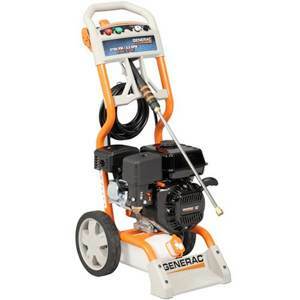 The Generac 5989/6022 is a 2700 PSI gas powered consumer pressure washer with 2.3 gallons per minute of water flow designed to power wash your deck, driveway, patio furniture and more. The Generac 6022 features a powerful 196cc Over Head Valve engine with low oil shutdown for better engine life. 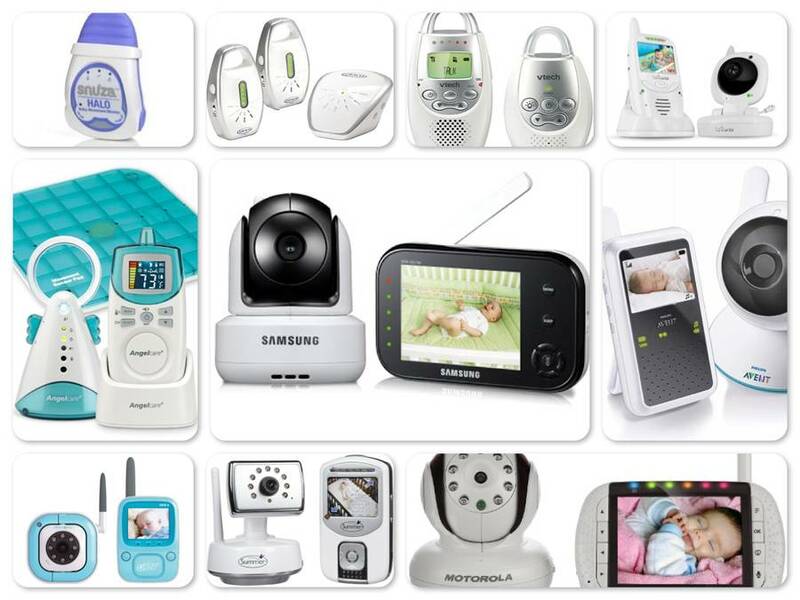 It is easy to assemble, setup and use. It is also easy to maneuver and the welded frame of this gas powered pressure washer is designed for durability, with a built-in step for easy starting and an integrated gun holster. This machine is very well designed with many ergonomic features like easily accessible high-performance axial cam pump and the easy to pull trigger to reduce fatigue. The pump of this gas powered pressure washer is located well above the ground, eliminating the need to kneel down to make hose connections. Generac pressure washer includes 4 Quick-Click nozzle tips (0 degree Blast, 25 degree Clean, 40 degree Wash and Soap) and a 25' hose. This machine is very well designed with many ergonomic features like easily accessible high-performance axial cam pump and the easy to pull trigger to reduce fatigue. The pump of this gas powered pressure washer is located well above the ground, eliminating the need to kneel down to make hose connections. Generac pressure washer includes 4 Quick-Click nozzle tips (0 degree Blast, 25 degree Clean, 40 degree Wash and Soap) and a 25' hose. Its compact design is amazingly easy to maneuver and store, with the engine and pump perfectly balanced above the axle. 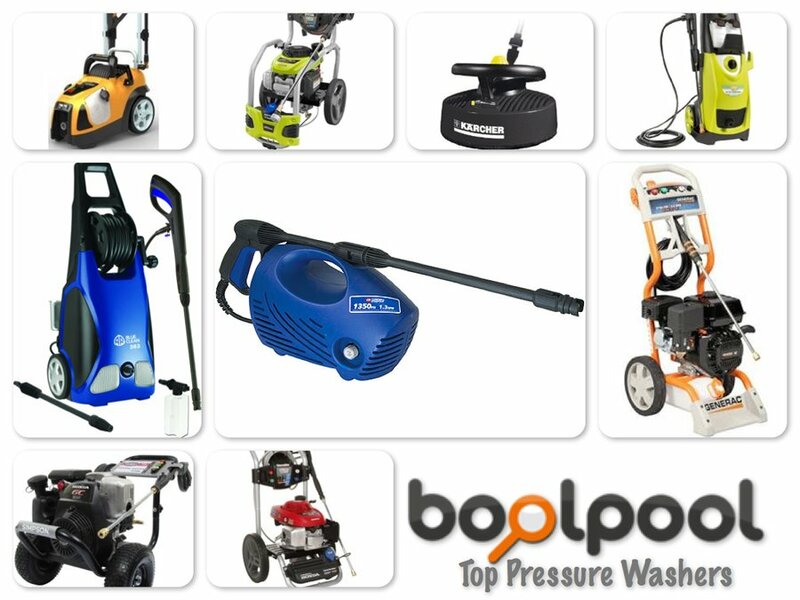 However, few users are not happy with this pressure washer since either they received a defective unit or the unit broke down after some usage. Some user reviews mention that the hose is not of very good quality and it may leak. Many users bought a better replacement hose. It also needs a better system to wind up the hose. A few buyers did not have good experience with manufacturer's customer service. Overall, the Generac 5989/6022, 2,700 PSI Gas Powered Consumer Pressure Washer is a powerful, well performing pressure washer for residential use. 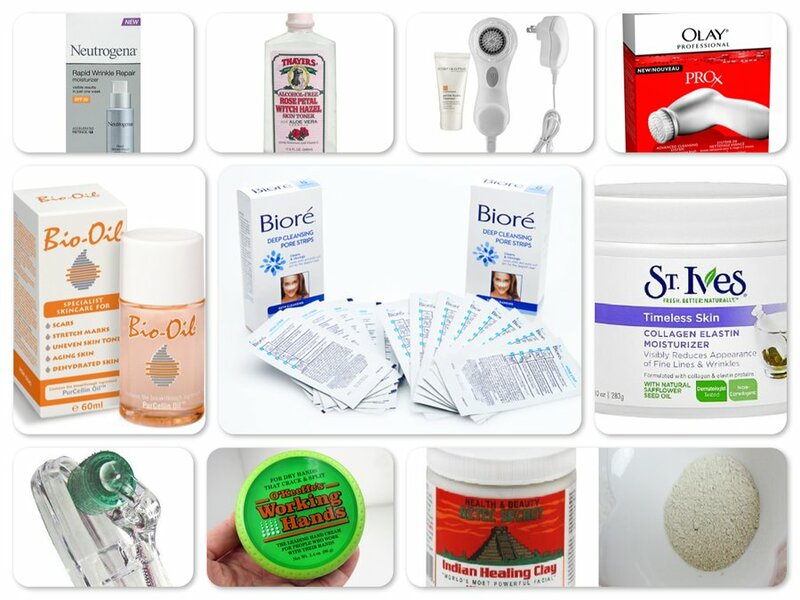 It is easy to setup and use for everyday use. Plenty of pressure for cleaning deck, concrete porch, driveway, windows, vinyl siding, sidewalks etc. The Stanley P1600S-BB is a 1600 psi direct drive electric pressure washer with 1.4 gallons per minute of water flow. It can go up to 2200 psi for toughest cleaning jobs. This premium light weight pressure washer has unique patented design tool belt and is ideal for home use such as washing patios, decks, cars, driveways, and siding. STANLEY pressure washer comes with a variable nozzle, a turbo nozzle wand, soap dispenser and reservoir, straight brush, a hose quick connect, and unique tool belt. This Stanley pressure washer is powered by a heavy duty electric motor and its pump is protected by low water auto shut-off. This lightweight, compact unit comes with 35 ft. GFCI power cord for maximize power washing range and mobility and a 20 ft. of high pressure hose to reach every nook and cranny. The Stanley P1600S-BB washer is easy to use and has plenty of pressure. The attachments are versatile and easy to use. 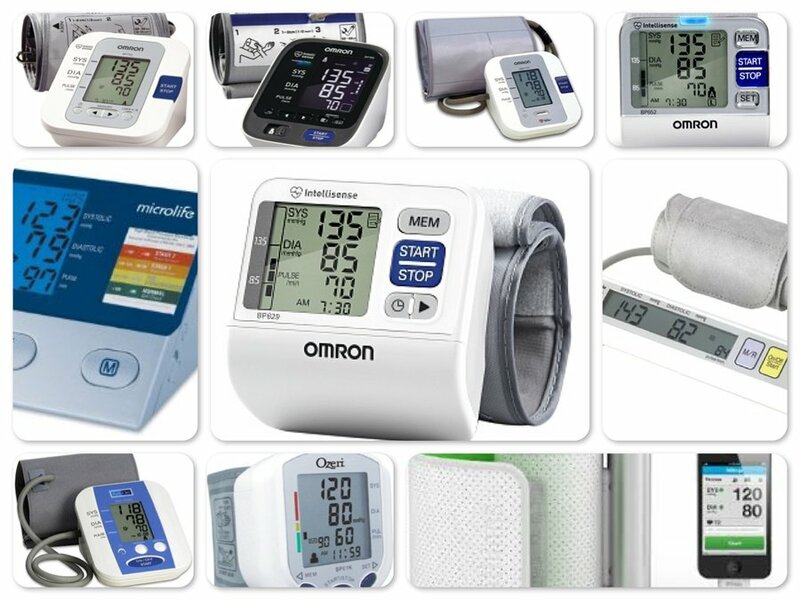 However, some user reviews mention that the power in this unit is less than expected based on its PSI rating. Also many users complain that the quick connect coupling and inlet adapter leaks. Overall, the Stanley 1600 psi 1.4 GPM Direct Drive Electric Pressure Washer (Model: P1600S-BB) gets good rating from users. 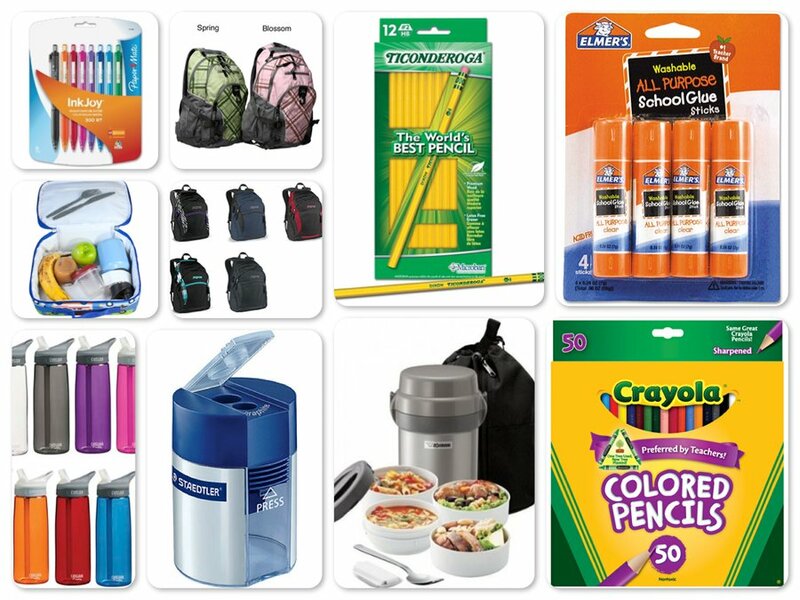 It is lightweight, compact and easy to carry around. 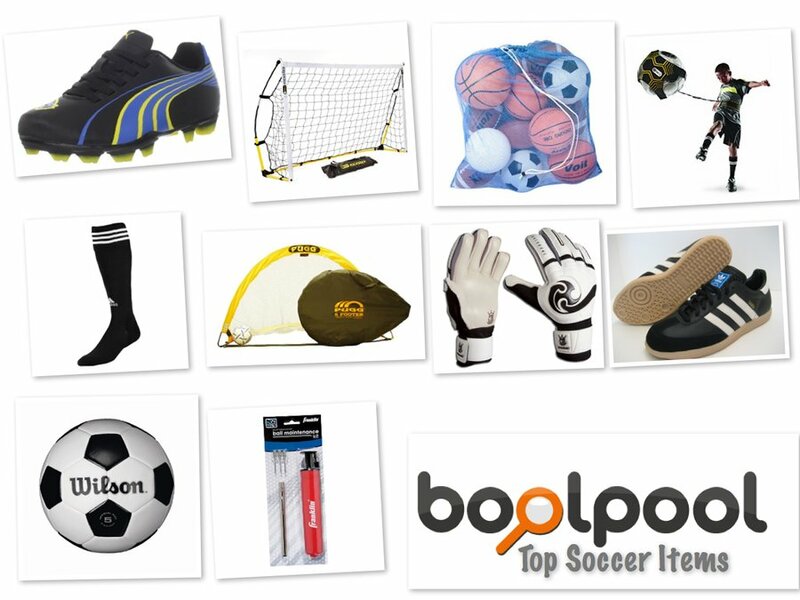 Users find it worth its price given its ease of use and included accessories. 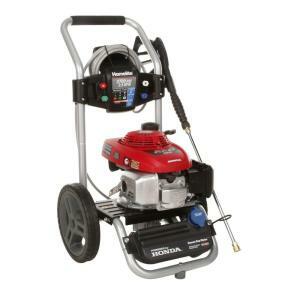 The Homelite UT80993E is a 2700-PSI 2.3-GPM Gas Pressure Washer which is powered by a 161 cc Honda engine. This axial pump pressure washer is designed to deliver impressive cleaning results and power needed for tough jobs. Its 25 ft. non-marring hose helps reduce kinking and tangling to reduce hassle and deliver consistent performance. The foam handle provides comfort for when you move the pressure washer to where it's needed. Large 12 in. never-flat tires also help moving this lightweight washer easy. The Homelite UT80993E comes with great selection of quick-connect spray nozzles for easy changes between jobs. It also features a manual startup for reliable ignition and on-board detergent tank for convenient use of cleaners. The Homelite UT80993E is a 2700-PSI 2.3-GPM Gas Pressure Washer which is powered by a 161 cc Honda engine. This axial pump pressure washer is designed to deliver impressive cleaning results and power needed for tough jobs. Its 25 ft. non-marring hose helps reduce kinking and tangling to reduce hassle and deliver consistent performance. The foam handle provides comfort for when you move the pressure washer to where it's needed. Large 12 in. never-flat tires also help moving this lightweight washer easy. The Homelite UT80993E comes with great selection of quick-connect spray nozzles for easy changes between jobs. It also features a manual startup for reliable ignition and on-board detergent tank for convenient use of cleaners. Users find this machine easy to use and smooth running. However, some users complain that the gas tank is too small on this pressure washer. Overall, the Homelite 2700-PSI 2.3-GPM Honda Gas Pressure Washer (Model: UT80993E) is a good pressure washer for home use. Users like it for easy starting and reliable Honda engine. 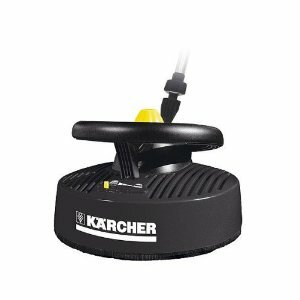 The Karcher Gas Pressure Washer T-Racer Wide Area Surface Cleaner T350 is a great attachment for cleaning surfaces such as patios, terraces and driveways without splash back. It cuts down cleaning time tremendously by cleaning a 12 inch wide area gently as it hovers, providing consistent, streak-free cleaning. 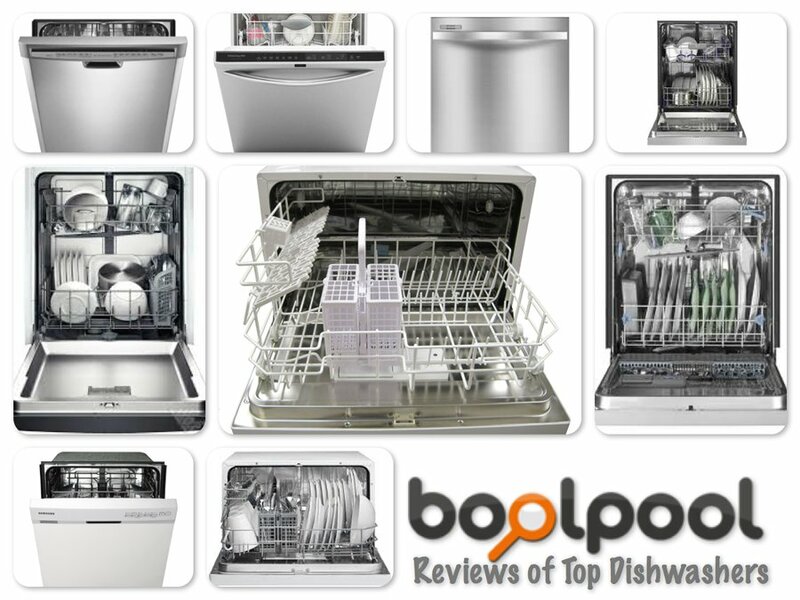 It includes two height-adjustable nozzles which spin at high speed for optimum streak-free cleaning. This tool is easy to use and attach to gas pressure washers. Users like the variable pressure feature along with the nozzles that come out for easy cleaning. Overall, the Karcher Gas Pressure Washer T-Racer Wide Area Surface Cleaner T350 provides good value for money by saving time and water while cleaning big concrete areas. Overall, the Karcher Gas Pressure Washer T-Racer Wide Area Surface Cleaner T350 provides good value for money by saving time and water while cleaning big concrete areas. Users highly rate and recommend this tool. 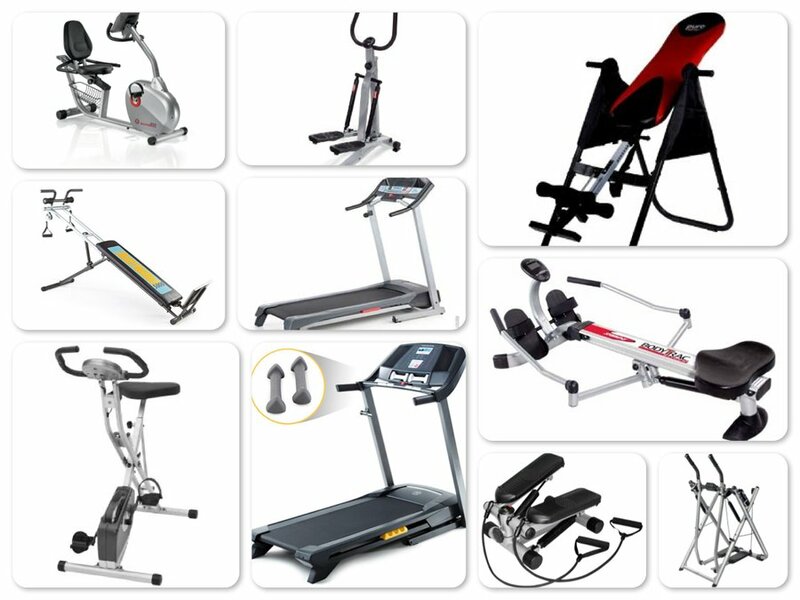 Reviews of Top 10 Exercise Equipment - Get Fit and Healthy!